good morning! hope everyone had a good weekend. we got a little bit done on the barn--cleaned all the stuff out of the rafters and temporarily relocated it . now we are ready to do the ceiling--which will be a bit of a slog--working overhead in a large space. the space is coming together and I am getting excited about moving into it. quite a lot left to do, but I can see how it's going to come together now. we are going to build a large closet in one corner that is insulated separately. 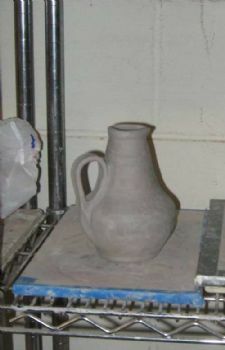 that way I can put a small heater in there and keep my clay and glazes from freezing. then I can use a second heater of some type that I can move around and keep near me when i'm working. and here are some pics--I got 2 of the three brie bakers done--was worried about one of the bowls trimming out right, but it went very well on both of these. still not sure if the bases are going to be okay--but I watched a youtube and figured out a good work around for this. when you finish throwing something you run a wire underneath it to release it from the bat or the wheelhead. 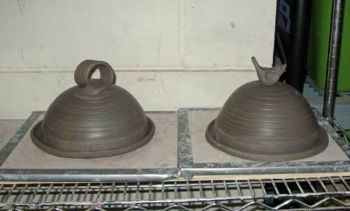 plates and platters and to some extent bowls, are thrown on bats so they don't have to be manually lifted off the wheel. the bat can be lifted and then the piece removed from the bat when it has firmed up. plates have to be thrown this way, because they would distort terribly if lifted off. the problem comes when you "wire off". plates are thin--and because these brie bases are not footed--there is no excess clay in the bottom. footed pieces have thick bottoms because you trim a foot later on by cutting clay away. the natural tendency of the wire is to rise up a little as it's drawn under the clay piece you are cutting--and because plate type pieces are so large--you have to cut across a fairly wide span--increasing the chance that the wire will cut into the clay on the bottom of the piece. I managed not to actually cut through these bottoms entirely, but I had a couple very thin spots that I attempted to patch. they will have to be ground down after the bisc fire. but I watched a youtube where the potter used a disc cut from roof paper affixed to the bat with clay slip. she then threw her piece on the roof paper, which she was able to slide onto another bat, and then when the plate was hard enough to flip over, she just peeled the roof paper off, and thus managed to get her plate off the wheel without the wire. brilliant. so that's my plan now--to cut some roofing felt discs and try my hand at some plates. but first I have to finish kellies Christmas card. she got the final image to me so I can work on painting the dogs now. it's very childlike and cute as her cards always are. she told me she has all the originals framed and hanging in their library/office, and she chronicles her life through these images. it's very neat to be a part of that. anyway--here are some pics of what I've been working on. the two brie bakers, a funky ewer that I actually like a lot, and the plethora of bowls that I have made the last two weeks as I reclaimed my bowl throwing skills--which apparently had been all but lost when I started the process! have a great Monday! It's so exciting to have your barn/studio coming along so nicely. I can't wait to see some pictures of it. 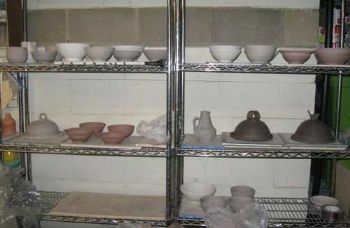 I love your pottery pics, they are so fantastic. The brie bowl with the bird on top is adorable and the ewer is lovely too. What colors are you thinking of glazing? You sure have been busy there, your work is really coming along well. I love the brie bakers and the pitcher is very interesting! !